Jacksonville rallies for Nakba 70, slams U.S. embassy opening | Fight Back! 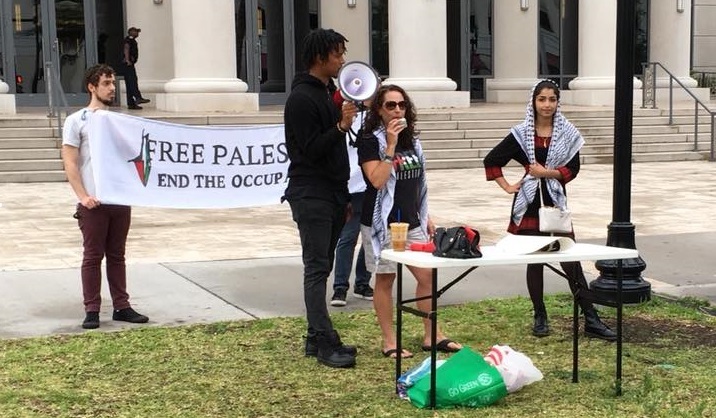 Jacksonville, FL - On May 14, 25 community members rallied in front of the Duval County Courthouse to condemn the massacre of 60-plus Palestinians who took part in Great Return March protests, as well as the opening of the U.S. Embassy to Israel in Jerusalem. Activists are also planning a film screening to further educate others about the struggle for Palestinian liberation. On Friday May 18, at 6:30 p.m., JPSN will be showing the film Junction 48 at the Center for Health Disparities building of Edward Waters College, located at 1401 Grunthal Street in Jacksonville.